The transmission of your vehicle, whether it is automatic or manual variation, is a very complicated piece of machinery. It has many intricate parts that allow for the transfer of the power created by the engine to the wheels. Transmissions don't often require repair as long as they are properly maintained, but problems do arise on occasion. These are five most common signs of transmission trouble, and should you experience any of them be sure to contact a local auto mechanic right away to have the issue properly diagnosed and repaired. If your automatic transmission doesn't engage right away when you shift into drive or reverse then some sort of problem is occurring, likely due to insufficient levels of transmissions fluid. If the problem isn't fixed it could end up causing your vehicle to lose its ability to move forward or backward. A slow response can be characterized by high revving when put into gear. A burning clutch smell is often associated with a driver learning to drive a stick shift. If you have been driving a manual transmission for years and begin to sense this odor then a new clutch or clutch adjustment is likely needed. Your car should never pop into neutral or another gear announced. If it does there is something mechanically wrong with your transmission. This can happen with both automatic and manual transmissions and it is a very dangerous problem as this will cause you to lose temporary control of the power in your vehicle. One of the most common signs of transmission trouble is a grinding noise heard during shifting. A shaking or vibration coming from the the gear shifter or clutch pedal may also accompany the noise. This can be caused by a few different issues so get to the shop right away! If you find any fluid in your driveway you should seek an auto mechanic right away as there should never be any leaks. Transmission fluid is usually a reddish color and will leak right under the transmission, generally located beneath the passenger cabin. If you're experiencing trouble shifting gears or if your vehicle shakes and rattles when you shift give your local auto repair shop a call to set up an appointment to have the problem diagnosed and repaired. 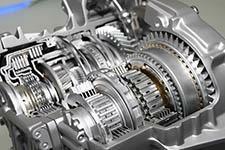 For professional transmission repair in Covina head to Hye Tech Auto. We offer expert diagnostics and repairs for all makes and models. To schedule any type of auto repair in Covina give us a call at (626) 332-5452 today.